WPL engineering manager Tim Holloway discovered how to make SAF systems more efficient. Holloway discovered how to make SAF systems more efficient when researching hydrodynamics. He presented his research to delegates at the European Waste Water Management Conference in Manchester in October. Holloway's research shows BOD removal can be improved by 20%. “Submerged aerated filter – or SAF systems have been around for a long time," he explains. "But until now we knew very little about the hydrodynamics going on inside." WPL specialises in the manufacture of packaged wastewater plants. 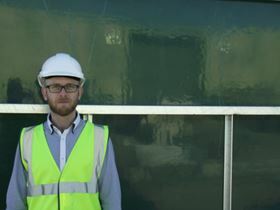 The company has already created a successful pilot SAF plant based on the research, which Holloway conducted as part of his MSc in Wastewater Treatment. Using Holloway’s research the company will now be able to create custom-designed modular treatment plants, to closely match site and discharge requirements, reduce over design and unnecessary power consumption. Refining the hydrodynamics of a SAF packaged wastewater treatment systems can deliver major reductions in cost and carbon footprint.